Manoj Bajpayee discusses his latest film, Traffic. Manoj Bajpayee, who startled audiences recently with his brilliant performance in Aligarh, has another promising film, Traffic, this week. Directed by the late Rajesh Pillai, Traffic was first made in Malayalam in 2011, and became such a cult film that it spawned three remakes -- Tamil's Chennaiyil Oru Naal in 2013, Kannada's Crazy Star in 2014 and now the Hindi version. Even though Bajpayee has a promising film on hand, he didn't seem keen on talking about it to Patcy N/Rediff.com, and preferred his cell phone at first. The actor finally spoke about the film, and what awards mean to him. IMAGE: Manoj Bajpayee in Traffic. You have done some phenomenal work in the Hindi film industry. Traffic is your second film after Aligarh this year. You have also done a short film, Tandav. I am happy with my work. The prime reason to come to this city was to work here and I am doing that. Why do you leave your parents' house? To get married? To have children? No, you can do that in the comfort of your home. I left my hometown to work. In that journey, I got married and had a child. What gives me immense pleasure is doing beautiful work. I am lucky and blessed that I am getting great roles. What made you sign up for Traffic? Traffic was a very good script, which was not made in Hindi. Rajesh Pillai, who made this film in Malayalam, had decided to make it in Hindi for a bigger audience. My role is very good. I got to work with so many good actors. Had I not done this role, it would have gone to someone else. It was better that I did it. Everybody wants to be a part of good films, so why should I give this role away to anyone else? The film is based on real-life incidents. How much of the film is fictional and how much is real? The incident that we are showing is real. Such incidents happen every 10 days all over the country in cities like Mumbai, Bengaluru, Chennai and Delhi. Some of the characters are real, but some things are fictional. The script has been adapted a bit keeping in mind the Hindi audience. So it is not 100 percent same. 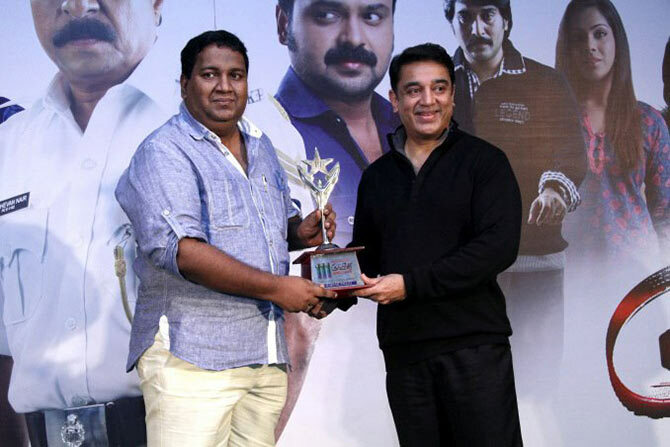 IMAGE: Rajesh Pillai receives an award from Kamal Haasan. It took three years to make this film, as it started in 2013. At a time when films are shot in 45 days, why did it take so much time? Actually, the film started in 2014. But yes, the film was delayed because Rajesh Pillai was a perfectionist and he took one-and-a-half year to make the film. We took some time to decide on the release date because every week there are about six or seven releases and we wanted a solo release date. Sadly, our director passed away at the age of 40. We are very sad about it, but what can we do? We have to promote the film. We miss him. May his soul be happy. How was it working with Rajesh Pillai? Our director was passionate and a perfectionist. He was never sick while shooting this film. Before he passed away, I think he was sick for only 15 to 20 days. He never looked sick when he was on the sets, I can show you his photographs. When he was on the sets he was healthy. Cast member Jishnu also passed away before the film's release. It must have been disturbing. I have not worked with Jishnu in the film. I did not have any scenes with him. All my scenes are with just three actors: Amol Parashar, Divya Unni and Parambrata Chatterjee. I heard about Jishnu. It is very sad that two people from the film died just before the release. Since the director is no more, who is looking after the release and the other aspects of the film now? If someone dies, that has nothing to do with the film. We are sad that these two people have died. Those who are associated with the film wanted it to get a good release. We are getting a good date to release the film. The whole industry is supporting this film. IMAGE: Manoj Bajpayee, Parambrata Chatterjee and Amol Parashar in Traffic. You play the traffic constable Godbole, who is in charge of safely transporting a human heart from one place to another. While portraying the role, what kind of emotions were running within you? I come totally prepared on the sets. Emotions can't come automatically. It requires a lot of preparation, there is a craft involved. There is a technique to show each and every emotion. The film has Bengali actors like Parambrata Chatterjee and Prosenjit Chatterjee, and south Indian actors like Divya Unni, Jishnu and Nikita Thukral. How was it to work with actors from diverse movie industries? When you get good actors to work with, you get to learn from them. You don't teach them because all of them are professional actors. All of them have some unique things that you can learn from, whether it is Parambrata or Amol Parashar. Divya Unni plays my wife and I got to learn from her too. All of them are seasoned actors. What has been your personal worst traffic experience? Every person in Mumbai has to face traffic everyday and get stuck for a long time. I have been stuck in traffic for two-and-a-half hours. I was on my way home from the airport, so I was fine with it, but this is very normal during the rainy season. 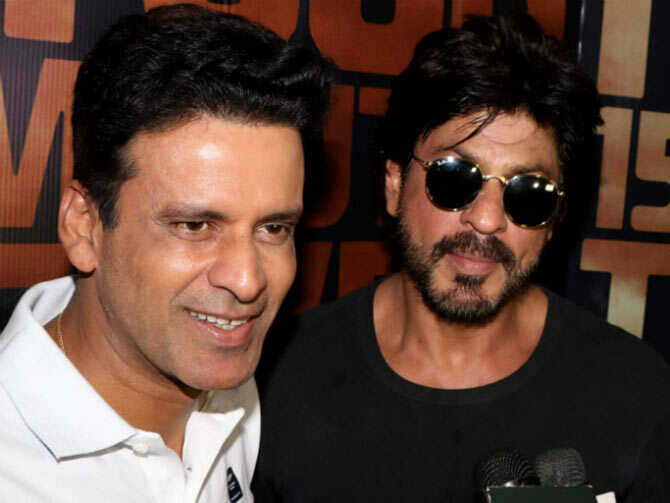 IMAGE: Manoj Bajpayee and Shah Rukh Khan. You met Shah Rukh Khan recently during the Traffic promotions. Both of you started out at Barry John's theatre group and worked in Veer Zaara. Shah Rukh came to Mumbai from Delhi before me and he became a huge star. We were kids when we met at Barry John's theatre (group). Both of us learnt at the same time. We were friends. Do you think your potential has been tapped? I am working everyday. This year, I have four releases. I have two releases every year, and sometimes, I don't. If I am sitting without work, I would have said that I have the capability to do so much more, but nobody is asking that from me. Now, I am working by the grace of God. So you can analyse whether my potential is tapped or not only after I am dead. Even I can't analyse my work now. When I say alvida to this world, please sit and analyse. How important are awards for you? Awards are not important at all. Awards in India are not important because Indian awards don't increase or decrease your money nor do they have any influence in the kind of films you are offered. What are your other releases this year? After Traffic, I will have Saath Uchakke, Missing, Duronto and a film with Drishyam Films. All of them will release this year. I talk to you (the media) and unwind! Spending time at home, watching films unwinds me. I go to my native place (in Bihar) or Lonavala (a hill station in Maharashtra) to unwind. I go abroad for holidays to unwind. When Hrithik and Kangana came face to face!